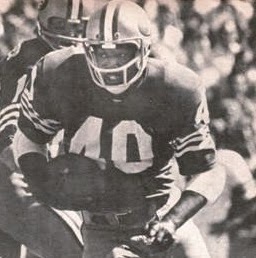 Jackson was chosen by the 49ers in the first round of the 1974 NFL draft (ninth overall) after averaging a school-record 7.2 yards-per-carry in college (212 attempts, 1529 yards). The first African-American to be offered a football scholarship by Alabama, he was converted from receiver to running back when the Crimson Tide shifted to a wishbone offense. 49ers went 6-8 to finish third in the NFC West. Jackson was plagued by injuries in 1975 and fell behind Delvin Williams on the depth chart, but was shifted to fullback in ’76 and formed a productive tandem with Williams as he rushed for 792 yards on 200 carries and caught 33 passes for 324 more yards. He rushed for 780 yards and a career-high 7 TDs in 1977 but was lost for all of ’78 with a knee injury. Jackson came back in 1979 to catch a career-high 53 passes for 422 yards while running for 375 yards and blocking well. He was traded to Washington in 1980 where he stepped in for retired RB John Riggins and rushed for 708 yards, but the return of Riggins in ’81, as well as injuries, relegated Jackson to a backup role in 1981 and ’82, his last two seasons. Overall, he ran the ball 971 times for 3852 yards (2955 with the 49ers) for a 4.0 average and 13 touchdowns and had 183 catches for 1572 yards and another four TDs.